At DCC , one of our wonderful old Texas Longhorn cows was Safari B 119. This photo shows her at age 17 raising her 16th Calf. This calf was weighed with all the other Longhorn calves fall of 1992 and was the 8th largest weaning weight of all the calves raised in 1992. 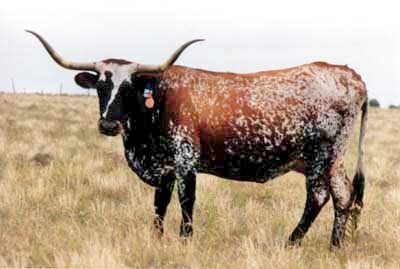 We think it's phenomenal in the Texas Longhorn breed when a 17 year old cow has the ability to outproduce younger cattle and competitively be the 8th biggest 205-day weaning weight. This cow is the grandam of the great herd sire Zhivago. Fall of 1993 Safari B119 was 18 years old with her 17th calf. The 1993 heifer weaned as the second best 205 day weight in a herd of 457 bred cows. I'm not aware of any breed of cattle that is capable of competing at age 18 for the best weaning weights among cows in the very prime of life. No other breed of cattle has the longevity to continue to make this happen. To see this wonderful old cow's udder in absolutely faultless shape at age 18, will make you love this breed of cattle even more. As Dr. Jan Bonsma would say, "That cow owes no man anything."